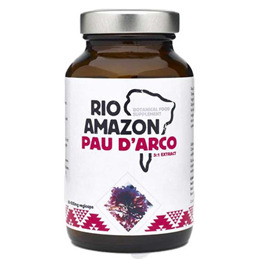 RIO AMAZON Pau D`Arco (Lapacho) contains antioxidants which support the immune system. Pau D’Arco extract is derived from the bark of a giant hardwood tree that is native to the Amazon rainforest in South America. Also known as `Purple Lapacho` - infusions prepared from the bark of Pau D`Arco trees have been used by many rainforest tribes for over two thousand years to contribute to the immune system. Pau D`Arco tea is prepared using only certified inner bark from the ‘cambium’ layer of these magnificent rainforest hardwoods. This process is entirely sustainable and the bark can be ‘harvested’ causing no permanent damage to the tree. Normal dose: 1 vegicap per day, before food. Below are reviews of RIO AMAZON Pau D`Arco (Lapacho) - 60 x 500mg Vegicaps by bodykind customers. If you have tried this product we'd love to hear what you think so please leave a review. Great vegicaps, easy to use and take! 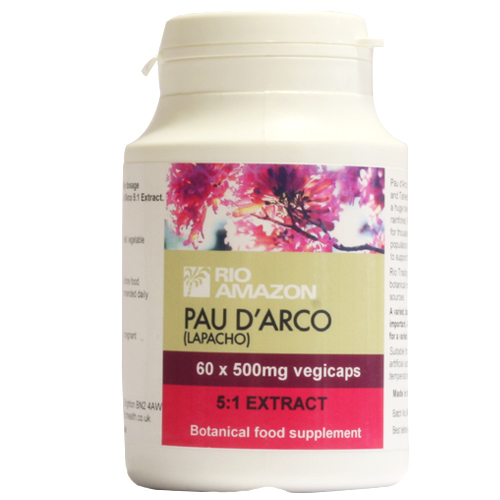 RIO AMAZON Pau D`Arco (Lapacho) 5: 1 Extract contains antioxidants which support the immune system. Pau d’Arco extract is derived from the bark of a giant hardwood tree that is native to the Amazon rainforest in South America.